The mystery is why the salesman thinks it's always going to work. Collin and I have been thinking about joining a gym/workout club/health club, whatever they're actually called these days, for a while now. I used to have a lifetime membership at one--until they went out of business. So call me skeptical. Fitness fads come and go. For a time, everybody seemed to be squeezing in exercise during their busy days of multitasking, with no time to drive to a gym, change, work out, shower, and drive home. Maybe that's why the one I belonged to went out of business. I don't know. I wish it were still around. When I was a member, it was a good distance from my home. Now, I live within walking distance of that location. There's a new one in the same plaza, but it lacks all the things I loved about the old one: steam room, sauna, whirlpool, pool. Still, Collin and I thought about joining. We both have arthritis and our doctors recommended exercise. We have equipment at home, but you know how that goes. At least we're not using them for clothing racks. Not yet, anyway. The neighborhood club advertised free seven day passes, so we decided it would be a good time to try it out, see if they could help us, if we could stick with it. I made an appointment for us to get signed up last Friday. We were shown around by a pleasant young man who told us about the equipment and the classes offered. Not only do they not offer all of those wonderful things I miss about my old club, they also don't offer the massages advertised for other locations in the chain. If we wanted just the basics, we can do that at home! After the tour, instead of giving us the seven-day passes, he pulled out a list of membership options. No matter how many times, I tried to steer him back to the passes, he kept pushing for a commitment--which we were not willing to make without trying out the facilities. Finally, frustrated, we left--and I voiced my opinion of the sales tactics on their Facebook page. I got an apologetic response and an offer of the promised passes, but we had already decided it would be a waste of time. I confess, this isn't the first time I'd had the same experience at other locations in this particular chain. Fortunately, I have no problem saying no. Glad you didn't join without the promised passes. I seem to remember a similar sales pitch but I was naive and signed. I never have trouble saying no. It's one of my favorite words! They really believe they can convince you or else they are so desperate to keep their jobs they do not care. I guess they think they have nothing to lose. They shouldn't have to work on commission--maybe they wouldn't end up driving customers away. You are just another body to pay money. After that how much do they really care. I wanted to try it first to see if we could handle the rigors of it. After we got home, I posted my displeasure on their Facebook page--and discovered a customer had suffered a serious injury while working out there. I hope you can find another place close by that offers the features you actually want! Good luck in your search. We're looking! I've heard the steam room and sauna are good for arthritis. Part of me feels a wee bit sorry for salesmen Norma, I would hate to try and sell anything to anyone, I'd be hopeless 😊 you're right though, some are waaaay too pushy and that puts people's back up! I can, too--but the club should be up front about the passes and the costs. They advertise "$10 a month, no contracts"--but when you go there, they want a minimum of $120 just to get started. When I objected to the additional fees, he said I could get it for just $10, but there would be no instructors to show us how to use the equipment, which is really stupid. 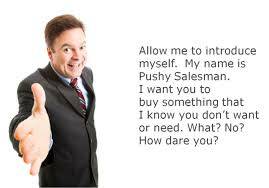 I've had salespeople who are way too pushy. I've known others who have had the sense to back off and leave me be. I've walked away from some things I really wanted because the salesmen got too pushy. I just won't tolerate it. I think those types must not have souls. How could they live with themselves? They work on commission, so they push for the biggest sales possible. No job should be commission-based. We'd all be better off. I hate those high-pressure salesmen, too! I used to be hesitant in speaking up but now I can get downright rude in refusing whatever it is they're trying to push! One can only take so much before getting tired of being manipulated. What a wanker. Glad you don't have a problem saying no. Salesmen at the mall run away from me now! Thanks for stopping by. I cannot believe it but we're done with The Lemon Tart Room. Served us well and we really enjoyed it but now, change, baby, change.